"This is my absolute favorite easy summer recipe my aunt recently shared with me - it tastes like you're biting into French onion soup! It became my favorite after only one taste. If you're having a barbecue, it's easy to make a lot of these in no time at all." I have been making these "little-goodies" for years on the grill. 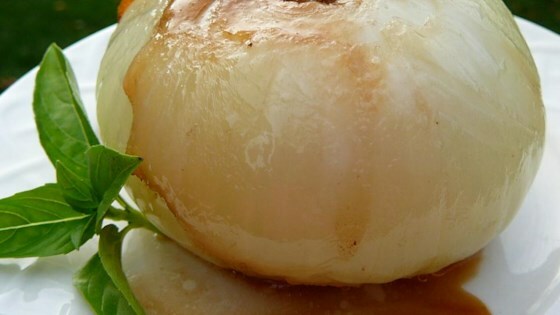 If you like onion soup, you will love this. Fresh pepper is good on them, no need for salt because of the bouillon cube. The recipe sounded really good but they turned out bland. I added a little brown sugar hoping the sweet would cook in with the butter and it was still bland. Would not make this again. Very good for something different. Very good, will become a staple in this house. Low fat, low cal and big on flavor. I served them with spicy turkey burgers, yum! !